JD Roofing & Guttering - Fascia/Soffits/Guttering, Roofer based in Mitcham, Surrey. 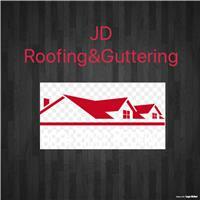 JD Roofing & Guttering is a professional roofing and guttering buisness. Over 10years experience due to it being a family trade. Very Reliable and sufficent. FREE same day quotations. Any Questions feel free to call text or email! Fascia and Soffits and Guttering, Roofer, Aluminium Guttering, Balcony Roofing, Chimneys, Concrete and Finlock Gutter Replacement, Concrete and Finlock Guttering, Dormer and Roof Windows, Dry Ridge, Dry Verge, Fascia and Soffits Repair, Felt Roofing, Fibre Glass Roofing, Flat Roofing, Gutter Repair, Leadworks, Liquid Plastic Roofing, Metal Roofing, Moss Removal, Pitched Roofing, Ridged Tiles, Roof Lights, Roof Replacement, Roofing Repairs, Rubber Roofing, Sealoflex Roofing, Single Ply Membrane Roofs, Slate Tiling, Slate and Tiled Roofing, Tiled Conservatory Roof, UPVC Guttering, Warm Roof Construction.